In the first part of this series, I discussed the problem of contamination in ICP-MS and how you can solve it. In this second part, I will delve into the tricky issue of interferences and how you can identify, remove and/or avoid them. Since the early days of ICP-MS in the mid-1980s, interferences with this technology have been well studied, characterised and documented. The most immediately noticeable interferences are those that form as a result of reactions between the plasma gas (Ar) and the sample constituents in the high temperature environment of the plasma. As a noble gas, Ar is not expected to be reactive, but in an up to 10,000°C plasma with acid vapours, water and other sample components being present, it forms a range of products, including ArO+, ArN+, ArC+, ArCl+ and ArAr+. These so-called polyatomic interferences interfere with Fe, Mn, Cr, As and Se respectively. Additionally, less abundant interferences from ArOH+, ArNH+, etc. are also observed and, when high amounts of sample matrix components such as Na are present, other species such as ArNa+ (which interferes with Cu) are also seen. Aside from Ar-based interferences, samples containing high amounts of S, P, Cl and C (e.g. from sulphuric, phosphoric and hydrochloric acids and organic sample components) produce a plethora of interferences including SO+, SO2+, PO+, PO2+, ClO+ and CO+ (which interfere with Ti, Zn, Cu, V and Si), as well as less abundant hydride adducts of all of these species (i.e. SOH+, SO2H+, etc.). In addition to these polyatomic interferences, elements that have isotopes of the same mass (such as 40Ca and 40Ar) interfere with each other and some elements (such as the rare earths) form significant quantities of doubly charged ions in the plasma, which go on to cause interference at half their isotope masses. Addressing interferences with hardware innovations. With all these interferences (and more), you might be wondering how you can get any sensible results at all out of an ICP-MS. The answer is that today’s ICP-MS instruments (such as the Thermo Scientific™ iCAP™ RQ single quadrupole ICP-MS) come complete with an advanced system known as collision/reaction cell technology that significantly reduces the majority of common polyatomic interferences, while retaining sufficient sensitivity for the interfered elements to allow them to be accurately quantified. This technology consists of a cell placed between the interface of the instrument (where the plasma meets the rest of the mass spectrometer) and its quadrupole mass analyser. This QCell™ in the iCAP™ RQ ICP-MS is filled with a continuous, low flow of (usually) He gas. As the ion beam from the interface enters the cell, polyatomic interference ions and analyte ions collide with the He gas and lose kinetic energy. 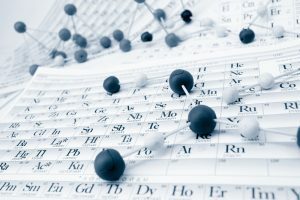 Even though the polyatomic ions have the same mass as the element with which they interfere, they have a larger cross-sectional area, which means that they undergo more collisions than the analyte ions do. The result is that they lose more kinetic energy than the analytes, allowing them to be rejected from the ion beam using a simple voltage barrier between the collision cell and the quadrupole mass spectrometer. The analyte ions can then be measured with much less interference – in fact, in many cases effectively interference free. This collision cell ion energy filtering approach to interference removal is known as kinetic energy discrimination (KED). The whole process is illustrated in Figure 1 below. Figure 1. 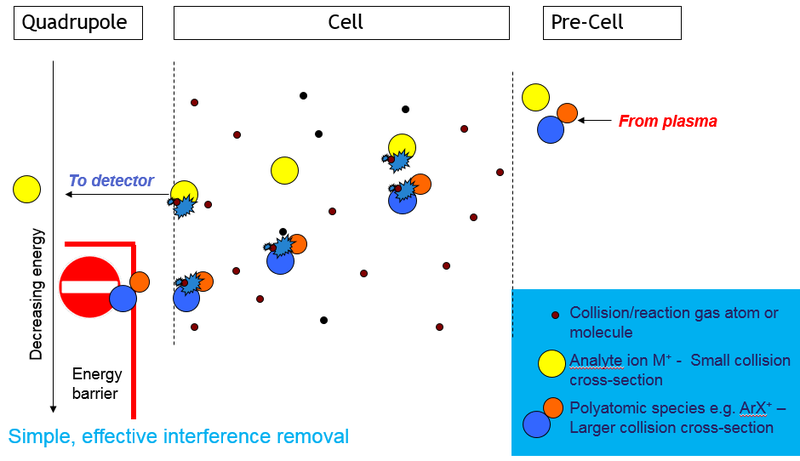 How collision cell technology with KED for ICP-MS works. In a few cases, use of H2 (a reactive gas), in the cell of single quadrupole ICP-MS instruments can be helpful, because certain interferences can be removed by chemical reactions with this gas, while the analytes with which they interfere don’t react (or at least hardly react), leading to much improved accuracy and lower detection limits. However, use of He and H2 with single quadrupole instruments, although highly effective for a wide range of applications, has its limitations. There are some interferences that are either so intense or so difficult to resolve, that even this powerful technology is defeated. The types of interferences that go beyond the capabilities of single quadrupole ICP-MS include the so-called isobaric interferences, consisting of isotopes of an element that have the same mass as isotopes of another element (such as 87Rb and 87Sr) and intense interferences generated by samples containing very high levels of matrix elements, such as metal alloy digests. Examples of this latter kind of interference include CoO+, which interferes with the monoisotopic As, and ZrO+/ZrOH+ which interfere with Cd. Other interferences which cause problems with single quadrupole instruments include doubly-charged rare earth elements, such as Nd2+ and Gd2+ which interfere with As and Se respectively. This is when triple quadrupole ICP-MS technology, such as that provided in the Thermo Scientific™ iCAP™ TQ ICP-MS, comes to the fore. Triple quadrupole systems allow mass filtering of the ion beam emanating from the plasma before the beam enters the collision/reaction cell of the instrument, which greatly enhances the selectivity of the instrument for interference removal and opens the door to using a wider range of reactive cell gases (such as O2 and NH3) than can be used with single quadrupole instruments. These additional gases allow more complex chemical reactions to be used in the cell to achieve far better removal of challenging interferences, such as CoO+, Nd2+ and Gd2+. Triple quadrupole instruments achieve their superior interference removal capability in one of two ways, depending on the interference to be resolved: the first way is ‘on-mass’ analysis and the second is ‘mass-shift’ analysis. On-mass analysis is based on transmitting the isotope of interest through the first quadrupole (Q1) while rejecting either the majority of, or all of, the other isotopes in the ion beam (more on this later). The selected mass plus its associated interference then enters the collision cell (Q2) which is filled with a gas such as O2. In this case, the analyte ion (e.g. Cd+) does not react with O2, while the interference (e.g. ZrO+ / ZrOH+) reacts rapidly to form higher oxides (such as ZrO2+ / ZrO2H+). The unreacted target mass is then transmitted, into the third quadrupole (Q3), where it is now effectively and completely separated from the interference, and detected. In contrast, with mass-shift analysis, after mass filtering the isotopes of interest with Q1 (in the same way as with on-mass analysis), it is the target analyte that is reacted with the cell gas in Q2 while the associated interference doesn’t react. In the cases of CoO+ and Nd2+ interference on As, and Gd2+ interference on Se (which are problems that arise during analysis of, for example, nutraceuticals containing Vitamin B and environmental samples such as soil / sewage digests, respectively), As and Se are converted by collision with O2 into AsO+ and SeO+ while CoO+, Nd2+ and Gd2+ do not react in the same way. The AsO+ and SeO+ product ions are then detected, interference free, after mass selection by Q3. As well as these two triple quadrupole modes, instruments such as the iCAP™ TQ ICP-MS can be operated in single quadrupole mode with no cell gas and with He/H2 cell gases for analyses that don’t require triple quadrupole selectivity. With all these different possible operating modes, you might be thinking that these instruments are very complicated to use. After all, if you are not so experienced with ICP-MS, how do you know which mode is best for all the elements you need to measure? The Thermo Scientific™ Qtegra™ Intelligent Scientific Data Solution™ (ISDS) Software that operates the iCAP TQ ICP-MS solves this complexity using a software-based method assistant called Reaction Finder, which automatically selects the optimum measurement mode, Q1 analyte, reaction gas and Q3 mass to be detected for you. If you want to compare the performance of different modes for a particular analysis within a single run, you can simply duplicate the isotope of interest and select a different mode from a drop-down list of available modes. On-mass and mass-shift operation with Reaction Finder mode selection is shown schematically in Figure 2 below. As mentioned above, Q1 can select the isotope of interest and reject either the majority of, or all of, the other isotopes. In most applications, using Q1 to transmit only the isotope of interest is not essential and only serves to potentially reduce sensitivity and degrade detection limits compared to operating it with a wider mass range. 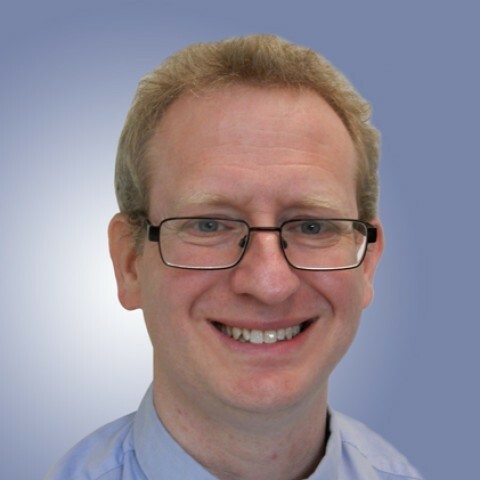 The iCAP TQ ICP-MS uses the advantage of controlling the mass transmission through Q1 to optimise sensitivity and detection limits for analyses that do not require single mass Q1 transmission, using an optimised software protocol to control Q1 called Intelligent Mass Selection (iMS). For those few analyses that do benefit from single mass transmission through Q1, the iCAP TQ ICP-MS software can be set by the user to a higher mass resolution mode to selectively transmit only the target isotope through Q1 at a peak resolution of less than 1 atomic mass unit (amu). All of the above-listed interference problems addressed by triple quadrupole ICP-MS can be solved using iMS – none of them require single mass transmission through Q1, making analysis simpler and faster for both routine and research operators.